Cucina 49: Are You Ready for Some Football? In the interest of full disclosure, I should say that I am not a football fan. I grew up in football country. My lack of attention to the football games of my high school years, in which I played in the marching band but yet never managed to absorb the rules of the game, is infamous. My master's degree is from the University of Nebraska, one of the famous football schools. I didn't go to a single game while I was there, although in my defense I was working two jobs in addition to my classes. David and I are invited to Super Bowl parties every year, and if I don't have other plans I'll tag along and read a book, glancing up occasionally at the commercials. This too has earned me much mocking. This year I don't have to endure the mocking, as the final show of Love, Loss and What I Wore is on Sunday afternoon. I'm hoping that our audience will be a big group of women who ditched their husbands/significant others in front of the television and yelled "I'm going to go have some fun with the girls--don't wait up for me!" as as they raced out the door. However, when I was deciding what to post next, this was the clear winner--an easy, totally delicious finger food that is as at home at a Super Bowl party as it was at the New Year's Eve party where they disappeared in the blink of an eye. The key here is really good-quality sausage. The original recipe calls for lamb sausage, but I substituted a spicy chicken andouille. It would be interesting with a good chicken apple sausage, but whatever you use, make sure it has some personality. Whisk together the egg and milk and set aside. Preheat the oven to 400 degrees, and place the sausages on a cookie sheet. Bake sausage until cooked through, about 20-25 minutes, turning halfway through. 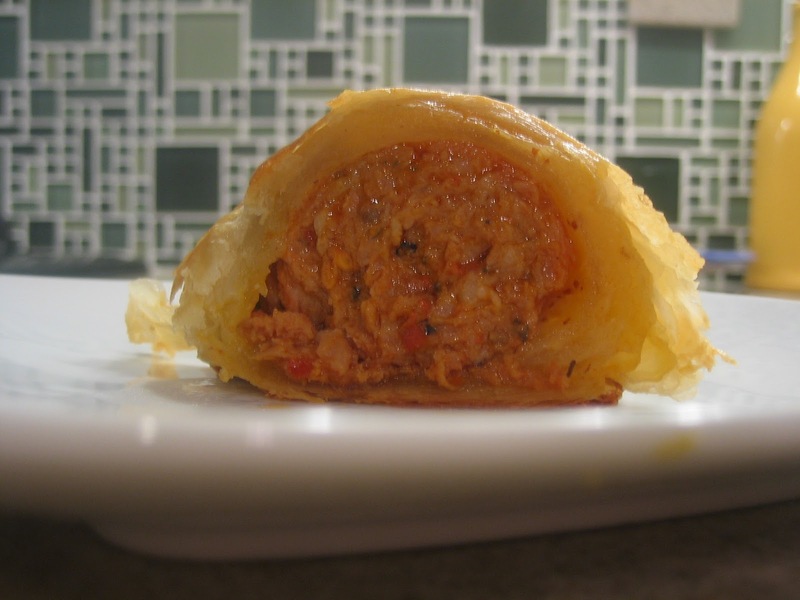 While the sausage is baking, place the sheets of puff pastry on a floured surface so the pastry won't stick. Slice each sheet of pastry in half lengthwise and brush with the Dijon mustard. 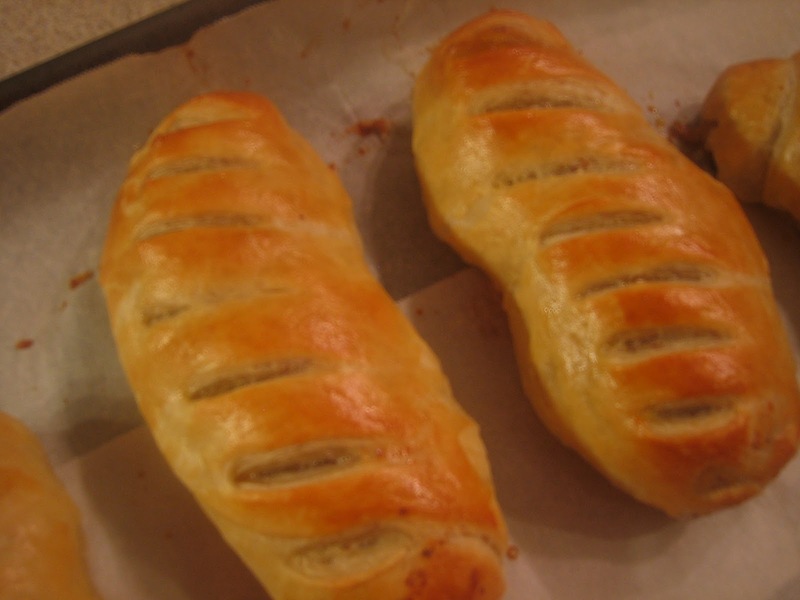 When the sausage is cooled, place one link on each length of puff pastry. Roll it up, covering the entirety of each sausage and brushing the ends with the egg wash and pinching them to thoroughly seal the bundles. If there is extra puff pastry on the ends, trim it off. Repeat with the other sausages. 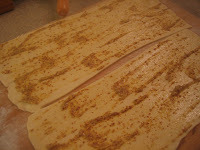 Line a baking sheet with parchment paper and space the sausage rolls out on it. Brush the tops of the rolls with the remaining egg wash and lightly score the tops of the rolls into 6-7 pieces. 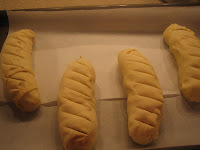 Bake for approximately 20 minutes, until the rolls are browned. Cool for about five minutes, slice and serve. OOOhhh!! Look at these! These are the perfect Superbowl snacks! This is too wonderful - I'll call them theatre snacks. On Sunday, I'm going to the theatre! Ha! Instead of asking are we ready for some football, it should be are we ready for some funny commercials and delicious food. Superbowl is that to me! 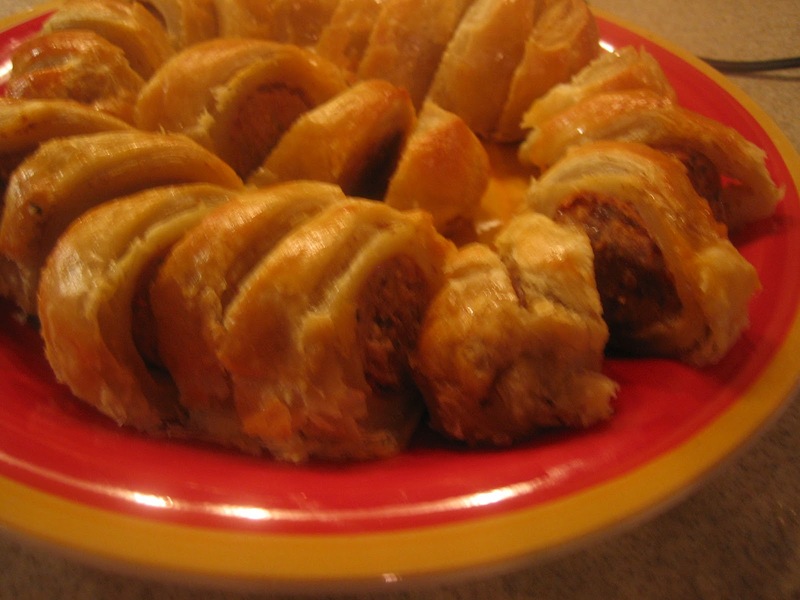 These are so much more than pigs in blankets, andouille sausage has lots more flavor-yum! No wonder it is always the case of the missing pigs soon after these are served. Saving this recipe. Enjoy the weekend! We have been invited to a party too but won't know if we can attend until Sunday morning. I'm with you on the FB. I love this "upscale" take on pigs-n-a-blanket! Have a great time at your last performance. I'm not too keen on watching sports. But, I do like to watch the commercials. Great recipe. What a great idea to have some ladies time while the men watch football! I think that could start a fad all over the U.S. While I don't eat pork, I bet these would be great with chicken sausage too. They look awesome! I am not a huge fan of watching sports on tv. Or sports in general. Lol. I am however a fan of your haute pigs in blankets. Delish! I am not a person for football or super bowl but my hubby will be glued to the tv watching the games. Nice and simple bread rolls they are looking to me as. Though I am not a fan of pigs, but sure am admiring these you have made. Oh, yeah, this is my kind of pigs in a blanket...yum! My family laughs at me when I bring a book to an NBA game...I pay a "little" more attention when it's NFL...but not a lot! I grew up rooting against Nebraska...living in Ames, Iowa, I can only remember one win (or was it a tie?) against the Cornhuskers when I was growing up! The pigs in blankets looks so delicious! I don't think I have ever watched an American football...still don't get it..why is it called 'football' while play with hands? Ooo, I think I am going to try this with some veggie sausage! I'm not a football fan either and I so very luckily got out of watching the game yesterday. However, if someone was serving this I would have totally stayed to watch :) Sounds awesome! This looks amazing! I love anything with sausage, and this looks perfect! No need for football to eat this! Dropping in from FoodBuzz, Cool Site...these look awesome!